On Customer Focus Web Stores, customers have the option to register on the site, which allows for faster order placement, review of previous orders, and better customer relations. At first glance it is easy to overlook these options, so this help sheet aims to outline the options available to you and where to find them. It’s important to note that due to the nature of store sites and the various themes available to site owners, these options can appear in a different part of the site, or a different area on the page. However, they will always follow the same format, so once you know what to look for it’s easy to spot! 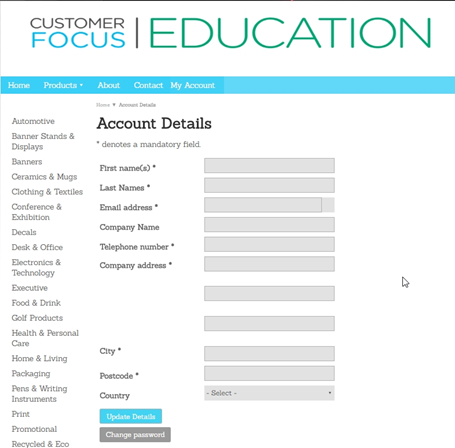 Before you can manage your account, you need to create it! First, you need to head to the web store. On the front page, you should see either (generally speaking) a module to the side, or a drop-down link of the navigation bar, labelled ‘My Account’. Hover over this, and click ‘register’ when the options appear. You will be greeted with the above form. You need to enter your details as accurately as possible on this screen, as these will be pulled through to any orders you raise on the site while logged in. At this point you should receive an email from the system to the registered address notifying you of the account creation and the link to set your password. Once you have your account, you need to be able to access your details and transactions. You can do this by going to the homepage of the site you have registered to. If the ‘My Account’ button has been placed on the sidebar, you will see a ‘My Account’ box with a number of links including ‘My Details’ and ‘My Orders’. If the My Account button is on the top navigation bar, you can hover over this button to produce the same options. My Details - Self-explanatory. You can change your personal and company details here, as well as reset your password using the button at the bottom of the screen. 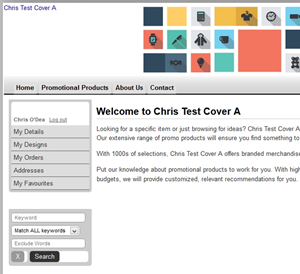 My Designs - On Brand-on-Demand-enabled websites, or websites which take advantage of TechnoLogo, you are able to keep a log of the different designs you have loaded into the site. These will be stored in this section for easy management. My Enquiries – This section keeps a log of all enquiries you’ve raised on the site, even if you never progressed these to an actual order. My Orders – As you may have guessed, this keeps a log of all enquiries which you have progressed through to actual orders. Addresses – This not only allows you to manage which addresses are associated with your account, but also allows you to designate a specific billing address, as well as a separate one for shipping if this is required. 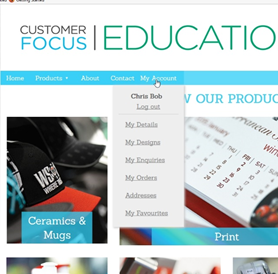 My Favourites – When logged into the store, you will notice an additional icon appear below each product in your search results. This is the ‘Add to Favourites’ button, which adds the product to this page. This allows you a quick point of reference for products you know you will be referring back to regularly, whether it is for repeat orders or just to keep an eye on pricing.